So, how do you help Mr Pepys to save Deptford's Royal Dockyard? The Mayor of London is 'keen' to hear your views about Convoys Wharf! Email graham.clements@london.gov.uk before 20 March 2014. Quote the application reference DC/13/83358 and include your name and address. If you have previously written an objection to Lewisham Council, there is no need to write again to the Mayor of London. You can, however, make comments on the very slight changes to the application that have been agreed by the developer in talks with the GLA. These changes are so minor you might want to write to say that they're welcome but it's just not enough! 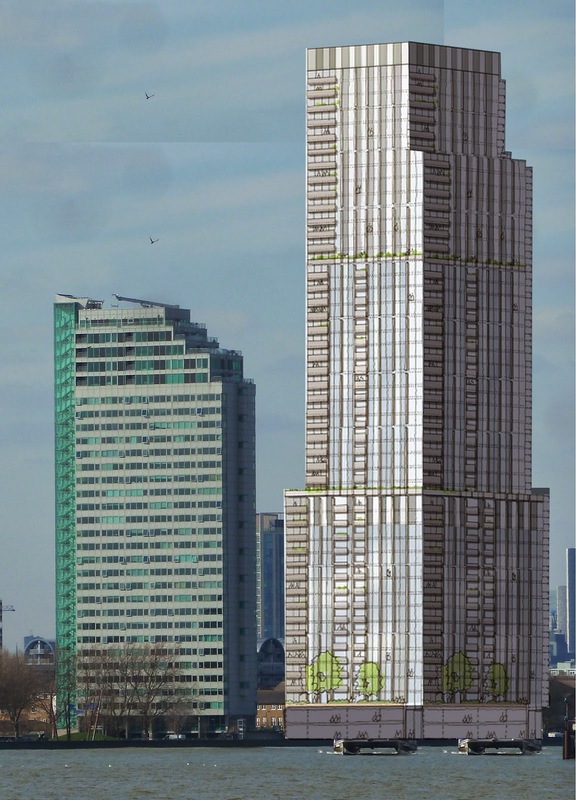 NB: Minor revisions to the application have now been made that allow for greater flexibility at the design stage, plus a reduction in the heights of one of the blocks, but those towers will still be there. Here's the architect's illustration which shows the new Paynes & Borthwick tower in the foreground of the proposed development. 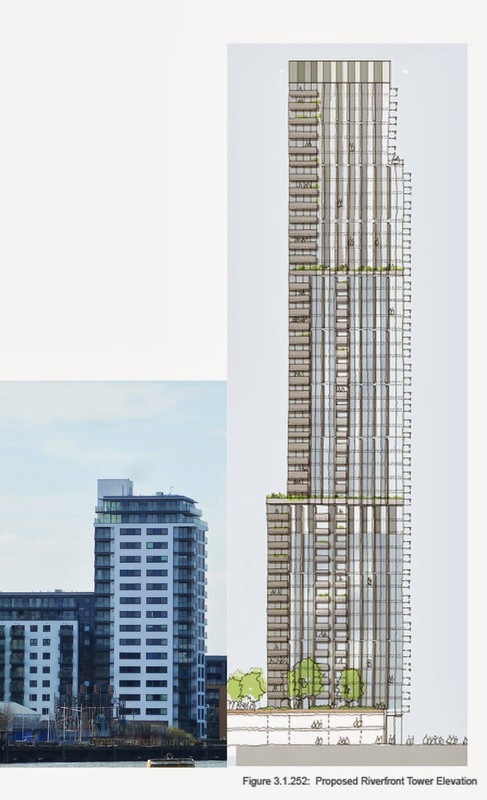 The foregrounding makes the waterfront tower look only twice as high, when in fact when pictured side by side it is three times as high (click to enlarge). 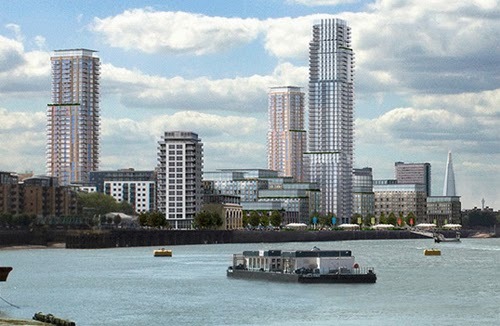 Here's the proposed waterfront tower side by side with Aragon Tower on Pepys Estate. • The World Monuments Fund has placed the site on its 2014 Watch List because it's endangered by insensitive redevelopment. See their statement on Deptford Is... here. A Regeneration schemes should identify and make use of heritage assets and reinforce the qualities that make them significant so they can help stimulate environmental, economic and community regeneration. This includes buildings, landscape features, views, Blue Ribbon Network and public realm. • Many of the significant above and below ground remains are being ignored by the developer: inter-related heritage assets include a scheduled ancient monument, six listed buildings and structures, and a further structure under consideration for listing, in addition to the dockyard archaeology uncovered during recent investigations – but all except the Grade II listed Olympia Shed will be built over. • The treatment of the Double Dry Dock is ‘unimaginative and disappointing’. • English Heritage "remain concerned that the overall scale of the development is such that the opportunity to create a distinctive sense of place which responds to the outstanding historic legacy of the site has not been realised"
• English Heritage believe "the overall scale of the scheme, including the tall buildings, will cause harm to the significance of designated and undesignated heritage assets"
• Lewisham Council says “there are parts of the site where historic connections and layouts have been lost or ignored...and more detailed aspects of the proposed layout fail to respect the underlying heritage assets or the location and setting of key buildings..."
• Housing units are likely to be marketed at a starting price of £300,000 for a studio and the wider Lewisham community is not likely to see any benefit whatsoever from this. • A percentage of affordable housing should be by the River Thames to avoid ‘class distinction’. NB: This latter point is partly addressed in the minor revisions made since the application has been with the GLA to slightly increase provision for affordable rented units and provision of family-sized affordable rented units. 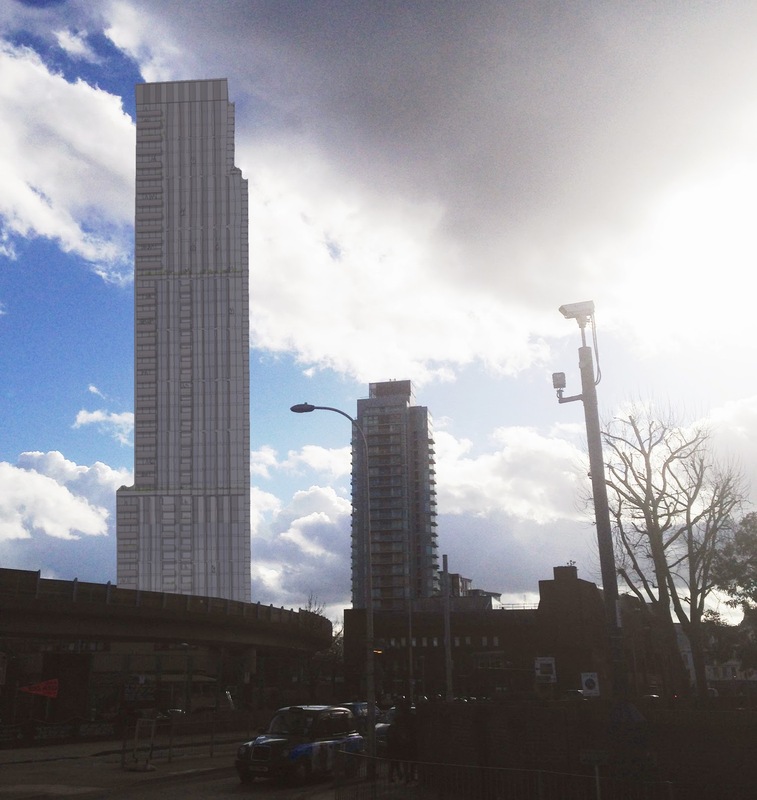 Lewisham Council were challenging the developer's formula for 'viability' – more realistic 'growth' assumptions [property values] "would allow for more affordable housing...to be increased from the applicant's present proposals." The application includes parking for at least 1800 cars. See Deptford Is... reports here and here. • In Lewisham Council's report, Transport for London concluded that further assessments need to be made in order to comply with the London Plan. • Lewisham Council said, "Given the scale of development and predicted vehicular movement to/from the site there will be a significant increase in traffic, both vehicular and non vehicular, on the local highway network, and modelling of key junctions by the applicant has highlighted potentially significant and unresolved capacity issues. These would be exacerbated if the London Mayor’s Cycle Superhighway scheme on Evelyn Street is implemented as this will reduce capacity..."
NB: We have not had time to read up on whether these very obvious transport issues have yet been reviewed, but there is certainly no modification in the 'minor revisions' that relates to the number of car parking spaces. • Thames Water states in its consultation response: “With the information provided, Thames Water has been unable to determine the waste water infrastructure needs of this application. The existing water supply infrastructure has insufficient capacity to meet the additional demands for the proposed development."